Livermore Valley might be the least-known major California wine region. I think it's fair to call it a major region. Livermore has two big companies -- Wente Vineyards and the Wine Group's flagship, Concannon Vineyard. It has more than 120 years of continuous winemaking history, and more than 40 wineries today. What it hasn't had until now is a guidebook. And that's a surprise, because Livermore Valley is a popular weekend wine-tasting destination that's less than an hour drive from San Francisco and San Jose. Of course, it's much harder to plan even a day trip without a guidebook. There's a good map on the Winegrowers Association's official website, but because it's an association, it can't give you any advice about who (or who not) to visit without irritating a member. 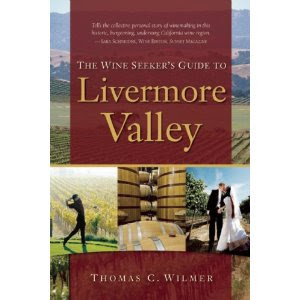 Unfortunately, Thomas Wilmer, author of "The Wine Seeker's Guide to Livermore Valley," isn't a wine writer, so he avoids qualitative judgments. But the good news is that Wilmer is an excellent travel writer, which means that he wrote good descriptions and if you read carefully, you should be able to figure out which wineries you're likely to like. The absence of criticism is more jarring in the restaurant section than for the wineries. It's easy to tell that Wilmer likes the Restaurant at Wente Vineyards because he gives it more space (2 1/2 pages) than any other. (I second Wilmer -- that's a fantastic restaurant.) But does it mean he doesn't like Izzy's Steaks & Chops because he gives it only two sentences? I'm not sure. As a writer, I learned something: readers will accept platitude-only copy about wineries more easily than about restaurants. Or maybe that's just me. Anyway, this blog post is far more prickly than the book, but also less useful. Wilmer doesn't tell you that Thomas Coyne is worth a visit and Retzlaff Estate isn't, and rereading the sections, I'm not sure you could discern that. But he does capture the spirit of both places well, and he gives the tasting room hours, tasting fees, and varieties made -- all things you need from a guidebook. And I'll leave it to Wilmer's book to give you the phone numbers, hours, etc. Order the book here. And while you've got your credit card out, my advertiser, Wine Chateau, is running a special on Wine Gift Baskets and Discount Wine: Buy 6 or more bottles and get half-off shipping with coupon code "blake68". Fortify yourself for the long, potentially dry week before you get to Livermore Valley. Have you seen the "Wine on 29" CD touring guide for the Napa Valley? No. Is it like the video in "Ring"? Will all of its viewers be dead within 7 days? Because that would be interesting enough to sell it here in this post about Livermore Valley. Your winery lineup is pretty incomplete. I live in Livermore and spend plenty of time in the vineyards. While I agree with Cedar Mountain (ports especially), Thomas Coyne (great Rhone style blends) and Mitchell Katz you are missing some serious winners. Steven Kent produces some Cabs I would put up against any in Napa. La Rochelle has world class Pinot's. Wente's Nth degree lineup is unreal. Cuda Ridge has great all around wines. And Bent Creek, Bodegas Aguirre, and El Sol are all worth a visit or two. If you don't want to break the bank on dinner at Wente go for great Italian at Tierra Mia on East Avenue. Anon: I like Steven Kent and La Rochelle; can't get to everything in a weekend. My plan assumes the reader will drink some Nth Degree wine -- they are good -- at the Wente restaurant. I once had a Bent Creek wine I liked a lot, have lost track with them since. I'm not familiar with the others you name; that's why I didn't write the guidebook. I might also add Fenestra to the list as well (across street from T Coyne). They produce a lot of varieties and so tasting there can often please a diverse group (those with different tastes). For me I have found some good value wines in the food-friendly whites/rose space (keep decent acid without being overly high in alcohol, sometimes a problem in Livermore). Steven Kent is amazing. He does both red and whites. His Barbera is amazing. A rare winemaker in that he does both well. Don't miss his tasting room. Wow, we've never seen this book. Thanks for the lead. Livermore needs some more notoriety.